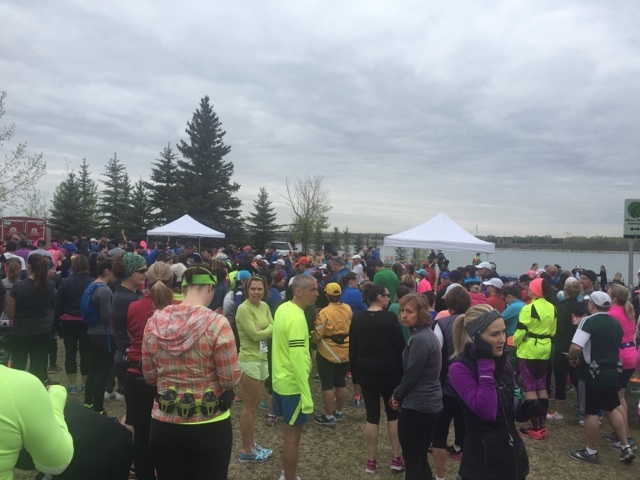 Yesterday I ran the Eye Ball The Wall race in South Glenmore Park. 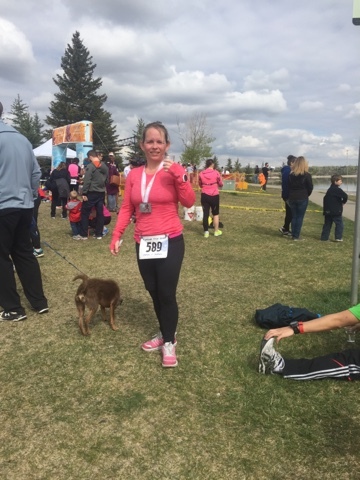 My weak right hip started causing me problems earlier in April when I started running more then 10km at a time. Under 10km my hip doesn't bother me but once I get passed that and start running 12km and up, it does. 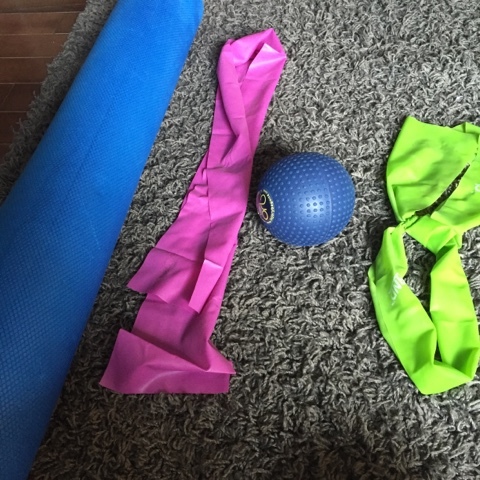 My weak hip causes my it band to work more then it should and it gets tight and sore and makes my knee hurt and gets my hamstring, calf and quad tight too. I have been getting treatment but more on that in another post. Needless to say though, I was really worried about running this race because there are some tough hills and I wasn't sure how my leg would respond. Outside of physic, I spent most of the week leading up to the race rolling and stretching out my legs so that they would be loose enough before the race. My it band was a little tight before the race but nothing too serious. Friday night I got all my stuff ready to wear. After I posted this photo, I realized I didn't have my running mitts or ear warmer but I did manage to track them down before I left in the morning. 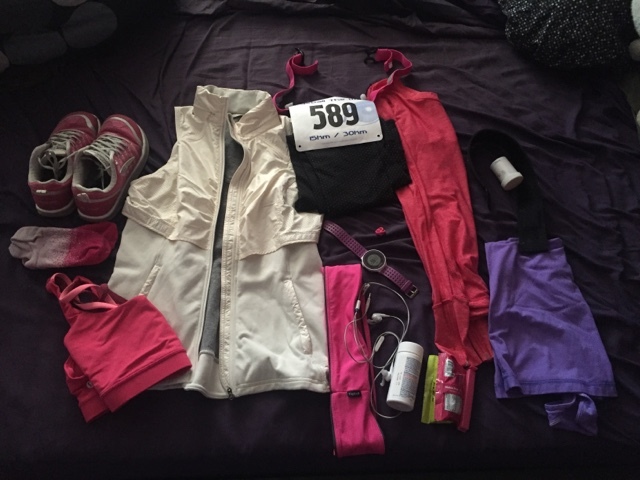 Last year I was way underdressed and it was so cold before, during and after the race. The wind off the reservoir was not pleasant to say the least. This year I overdressed. I was warm waiting for the race to start but like by the 2nd km, I was so hot. It sucked. Maybe next year I will get it right. 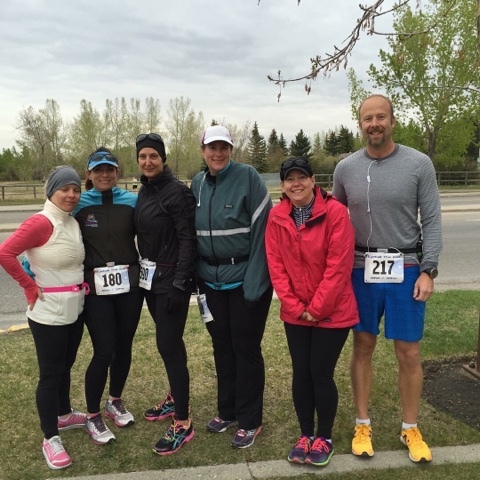 Here are some of my boot campers before the race. The husband is not a boot camper but is married to one. Alex is also not a boot camper but she's friends with me so it works haha. 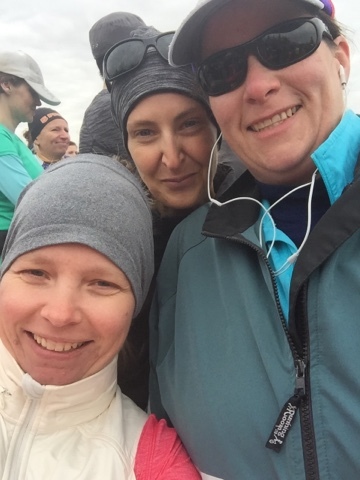 A quick pre-race selfie with Alex + Theresa before the race started. They both did so good yesterday!! They doubled the participants this year and there were a lot of people. It's all run on paths and sidewalks so it was really crowded for the first 2 or 3km and then it spread out really well. Even when the 30km'ers turned around and we shared the path with them, it was hardly noticeable. The only annoying people were those on the trails not participating haha. Greg and the girls rode their bikes to technical training in Woodbine that morning and then biked over to the park and played in the playground until they figured I was close to finishing. They were both right near the sidewalk waving at me as I approached the finished line. I love seeing how excited they were to see me finish. I finished in 1:45 officially and I am quite happy with this. I was 8 minutes faster then last year's time which makes me really happy. Ironically enough, it was my left hip that I felt tighten up during the race and behind my knee and below my knee cap were mildly uncomfortable. Post race photo with all these great people. I feel so fortunate to have such a strong group of ladies that I can count on to motivate and encourage me. 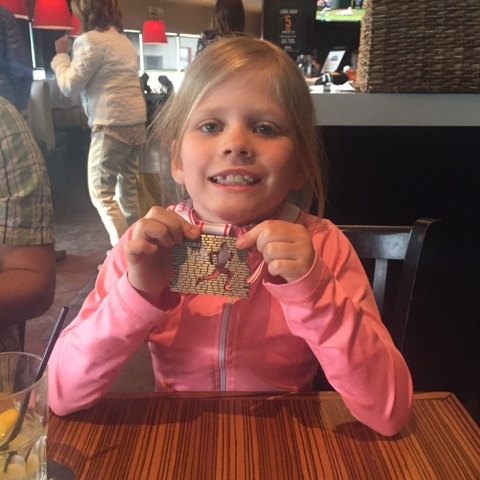 After the race, we went to 1600 World Bier Haus in Glenmore Landing which was near the race start and finish line. It was so good and nice to have some real food in my stomach. There were a lot of other participants who had the same idea. 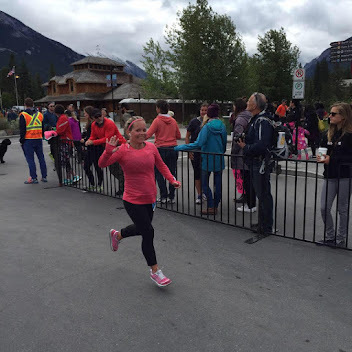 My next official race is the Banff Marathon on Father's Day where I am registered for the half. 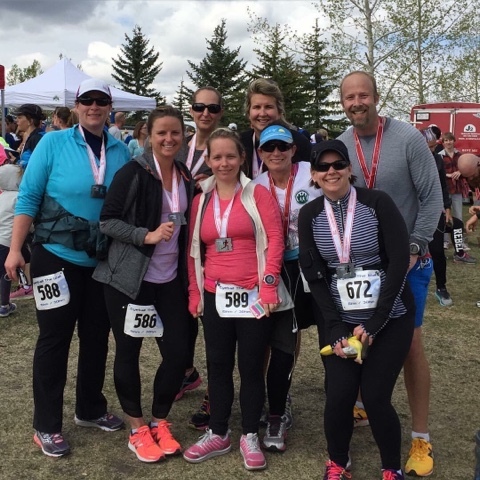 I can still register for the Calgary Marathon on May 29th but I am undecided if I will run. It's one of my favourite races and I would like to do it but Greg thinks I should focus on getting my right hip stronger and just focus on being better for Banff. He's probably right but I still would like to do it. If I don't run Calgary, then I will definitely sign up to volunteer!